Between Vertigo's Fables comics, ABC's Once Upon a Time, NBC's Grimm, and the endless upcoming Snow White movies, you've probably brushed up on your old familiar fairy tales. But the Brothers Grimm have a whole canon of stories that aren't constantly readapted for page and screen. 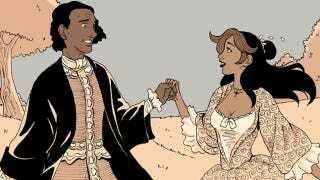 The webcomic anthology Erstwhile Tales gives some love to the more obscure Grimm's fairy tales. Gina Biggs, who created the lovely Japan-based romance webcomic Red String, adapts some of the more unusual Grimm's fairy tales. The stories are then illustrated either by Biggs herself or by Louisa Roy or by Missing Monday creator Elle Skinner. Thus far, Biggs has adapted four forgotten stories: "The Farmer's Clever Daughter," "A Tale with a Riddle," "Maid Maleen," and "The Bird, the Mouse, and the Sausage" (currently in progress). They're an interesting mix of tales, one that makes so many of the princess tales Disney feeds seem dreadfully uniform. "The Farmer's Clever Daughter" (also known as "The Peasant's Wise Daughter") is about a young woman who succeeds again and again through her intelligence. "A Tale with a Riddle" is a surreal rescue story that's more about the puzzle at the end than the actual rescue. And the way Biggs adapts "Maid Maleen," the titular character comes off as a prototypical self-rescuing princess, even if there's more than a little luck involved in her ultimate reunion with her Prince Charming (who, incidentally, couldn't be bothered to knock down a stone wall while other mythical princes are off fighting dragons. Humph). "The Bird, the Mouse, and the Sausage" is a bizarre children's tale with a grisly ending. Erstwhile Tales is an excellent excuse to delve deeper into the Grimm collection. And who knows? Maybe some of those more obscure stories will eventually make their way onto television.